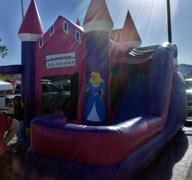 Water Slide Rentals & More! Inflatable Water Slide rentals are incredible attractions when used as the centerpiece of your event. Just the size alone will attract your guests. Combine that with the excitement of hours of bounce, water sliding fun and you'll make big impressions! Check unit dimensions to make sure you'll have room for your inflatable slide rental unit; length, width and most importantly height. Browse the inflatable slide inventory below and click on the "More Info" link for more details and to make a reservation. Inflatable Water Slide rentals are incredible attractions when used as the centerpiece of your event. Just the size alone will attract your guests. Combine that with the excitement of hours of bounce, water sliding fun and you'll make big impressions! Check unit dimensions to make sure you'll have room for your inflatable slide rental unit; length, width and most importantly height. Browse the inflatable slide inventory below and click on the image or title for more details.